You’re headed to Ireland but, like me, you didn’t really leave a lot of time in your itinerary for Dublin? No worries! I walked 40,000 steps after being awake over 30 hours to find out what to do in Dublin in one day so you wouldn’t have to. 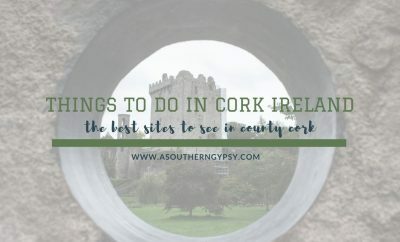 Dublin is a fun city but if you’re anything like me, you’re anxious to get out and explore the backroads of Ireland and why shouldn’t you be – it’s truly an incredible country. 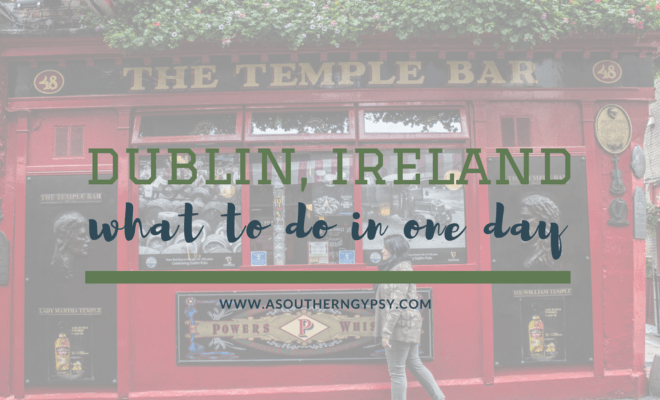 But, first, make sure to check out what to do in Dublin in one day. Trinity College and the Library is gorgeous and in my opinion, a must see! The Long Room was built between 1712 and 1732 and houses 200,000 of the Library’s oldest books. I’m not sure if you’re like me and you love the smell of books but you’ve not truly had that full experience until you’re standing in a huge room with 200,000 extremely old books. It smelt like heaven and knowledge rolled into one. I would highly suggest doing two things if you want to visit the Trinity College Library (which I hope you do! ): purchase your tickets online for the earliest time slot and get there early. If you purchase the tickets online, they are a bit cheaper. There will be people already lined up when you arrive so I suggest arriving maybe 15-20 minutes before your scheduled slot. The reason why I suggest picking the first time slot is that when you enter the building – completely bypass the Book of Kells exhibit and head straight to the Long Room. If you do this, you’ll be able to get pictures with zero people in them or at least only a small handful of people. Unless looking at professionally done photographs, most pictures I’ve seen of the Long Room have tons of people in them so I was shocked when I was able to get pictures with hardly any. Don’t worry, if you wanted to see the Book of Kells, you can backtrack and do so after checking out the library in peace. When people think of Dublin, St Patrick’s Cathedral usually comes to mind. 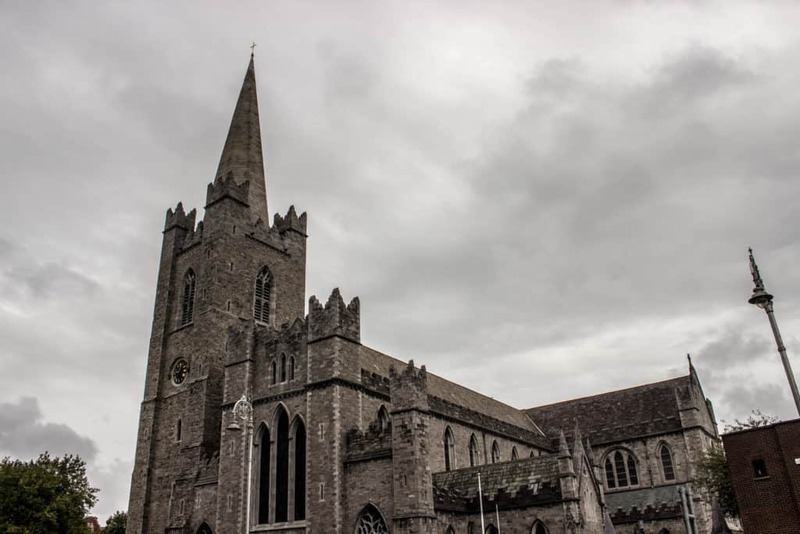 It’s a pretty popular place to visit and while, yes, there are plenty of churches to visit in Ireland – I think St Patrick’s Cathedral in Dublin should be on your list. Since 1870, St Patrick’s Cathedral in Dublin has been designated the national church for the whole of Ireland by the Church of Ireland. St Patrick’s was founded back in 1191 making it worth a visit just for that reason alone. Albeit a little touristy, I would suggest visiting the Guinness Storehouse at least once. The self-guided tour is pretty cool even if you don’t really care about beer or brewery tours. While I like a beer every once in a while, a brewery tour is a brewery tour to me. 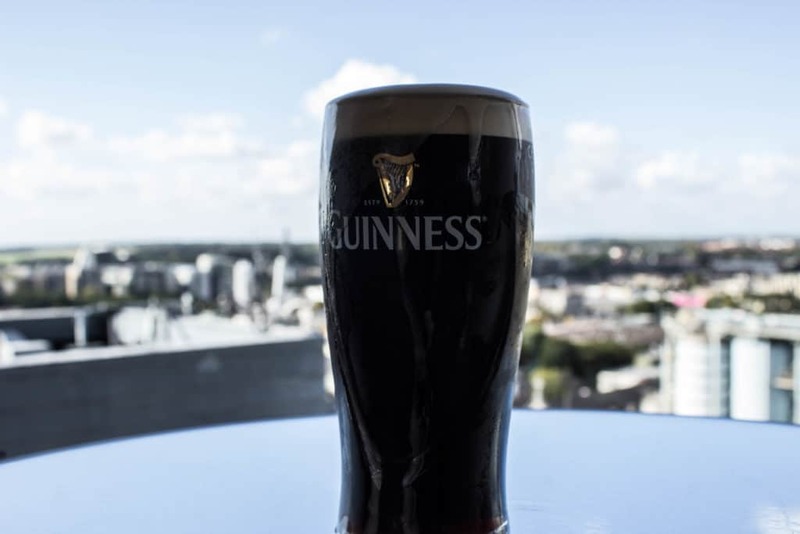 However, Guinness Storehouse was really nice because the building is quite beautiful, the pure magnitude of is amazing, the view of the city is one of the best and they give you a free pint with your tour price. Definitely another tourist spot but if you really only have one day, you need to hit up all these spots, right? We stopped by during the day because that’s what time allowed but if I could do it over again, I would go both during the day to get some good photos but at night to enjoy the nightlife, of course. The history of the area goes like this: Sir William Temple moved to Ireland in 1609 and built a house on the corner of Temple Lane and Temple Bar (the street). 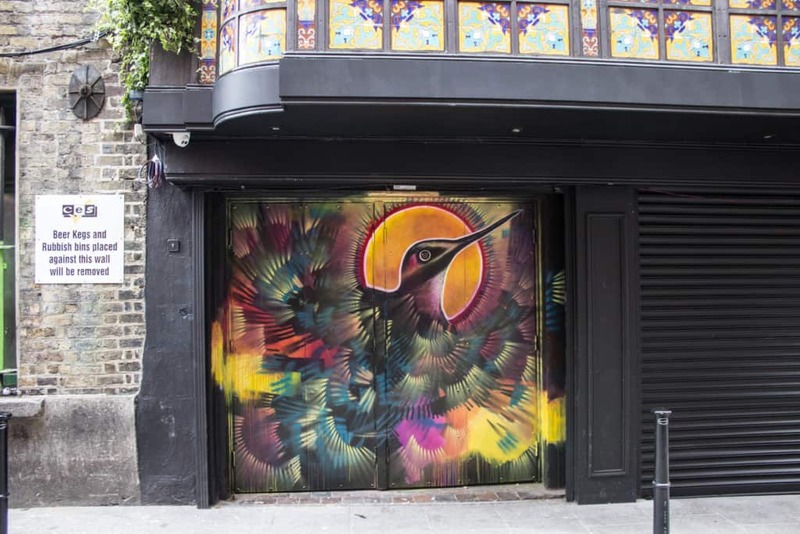 In the 17th century, Bar (originally known as Barr) referred to a raised sandbank used for walking on leading the River Liffey embankment near the Temple land to be known as Temple Bar. 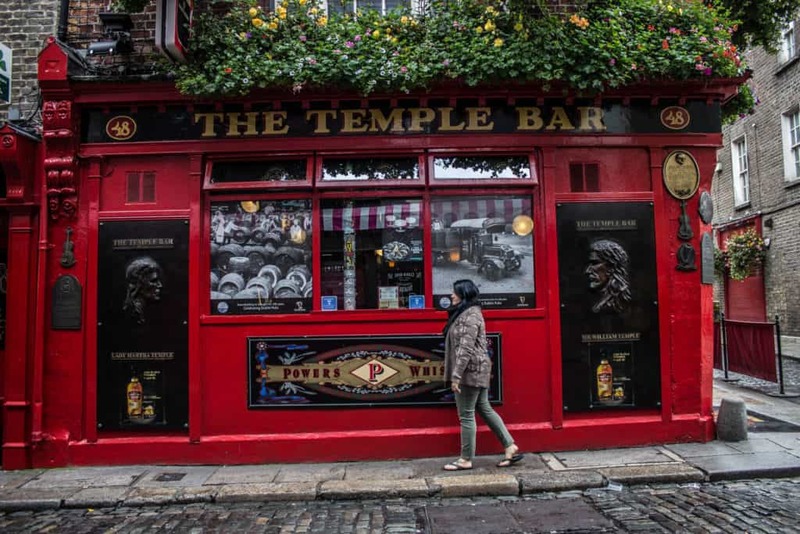 Now, this whole area is known as ‘Temple Bar’ with The Temple Bar Pub being one of, if not, the most popular pub in the city. 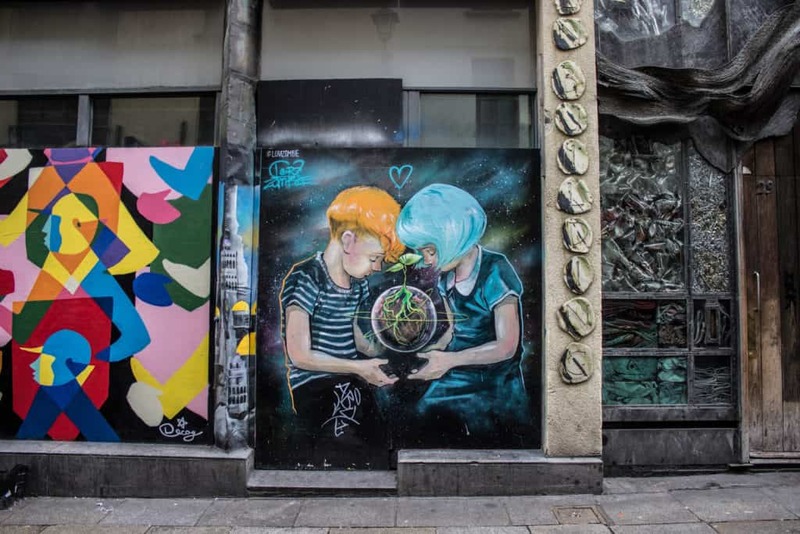 At first glance, you wouldn’t think there is much street art in Dublin but the more we wandered the streets, the more we saw. 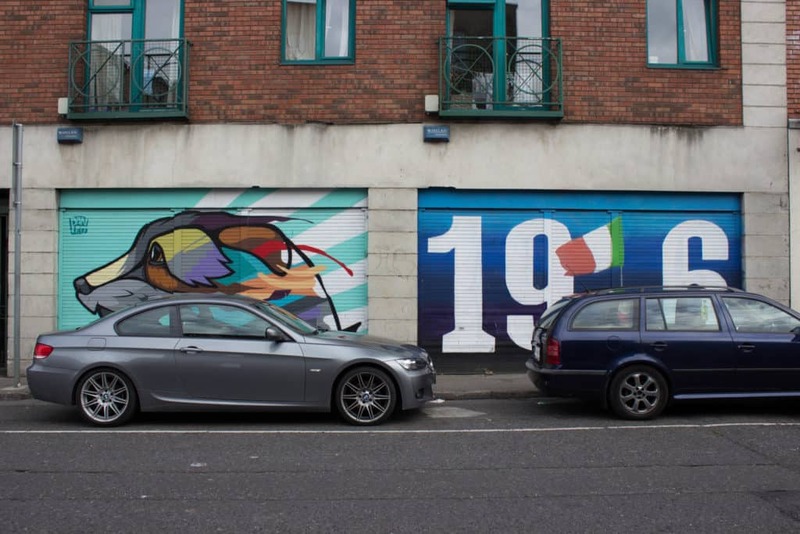 I would definitely suggest, if possible, walking everywhere you can so you can stumble across the colorful walls of Dublin. 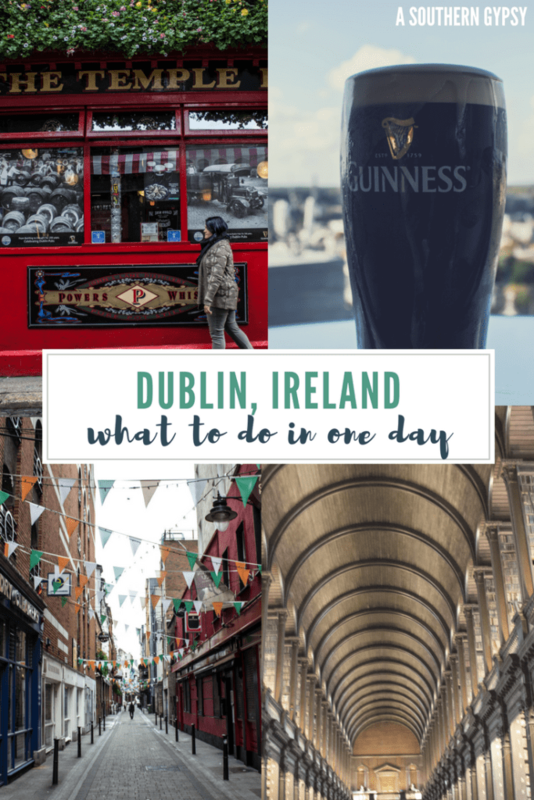 If you’re lucky enough to be in Dublin for another day, check out how to make the most of Dublin in 48 hours. 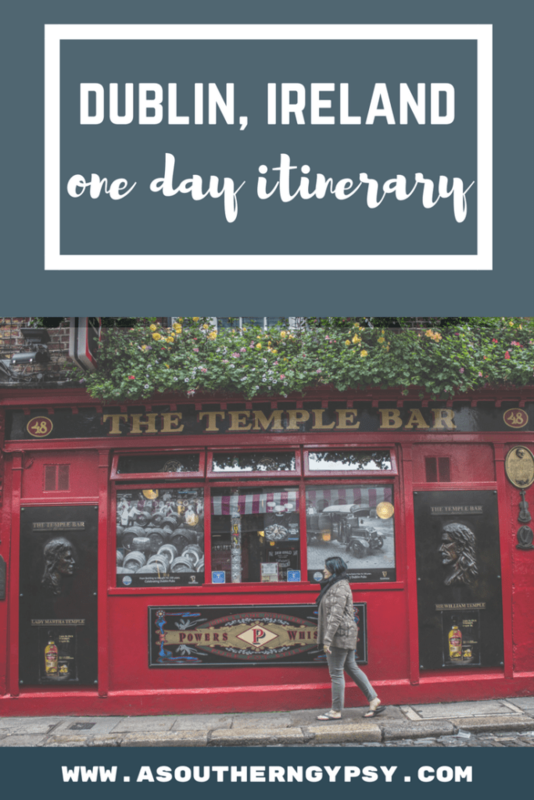 You didn’t think I would forget food when talking about what to do in Dublin in one day, did you? Food is always at the forefront of my brain. Being vegan, I have to plan ahead of time but, also, I just really love eating. 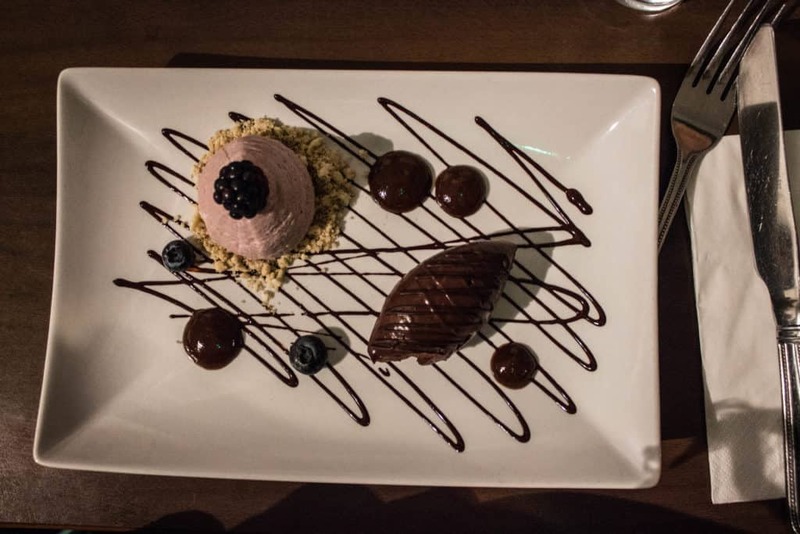 Here is what I would suggest if you only have one day for vegan food in Dublin. Head to Cornucopia for breakfast. It is the most well-known vegan spot in Dublin, in my opinion. While I went for lunch, I’m confident that their breakfast is just as good and there aren’t as many breakfast options in Dublin. 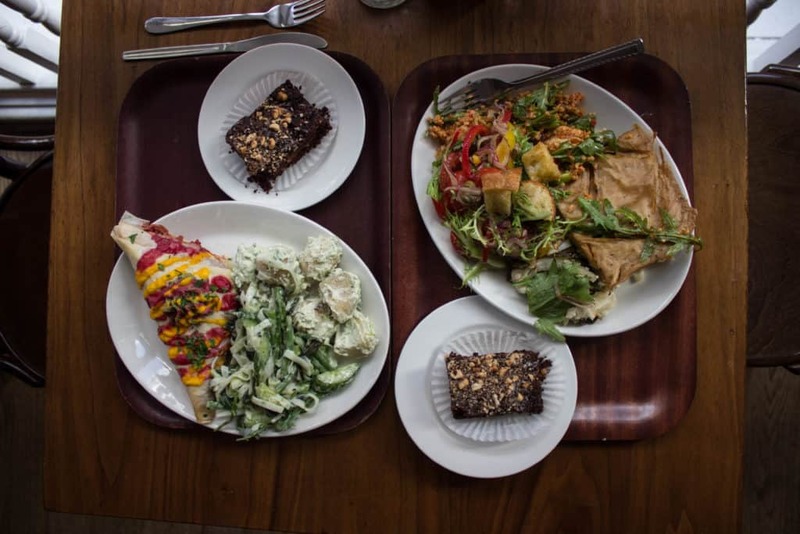 The other more well-known vegan spot in Dublin is Sova Vegan Butcher. I only got to have dessert here and that alone was mouth watering and left me wanting to lick my plate. I swear, I almost did it. Their regular menu looked so amazing and I was kicking myself for not having to time to try it. Make sure to head here for lunch. 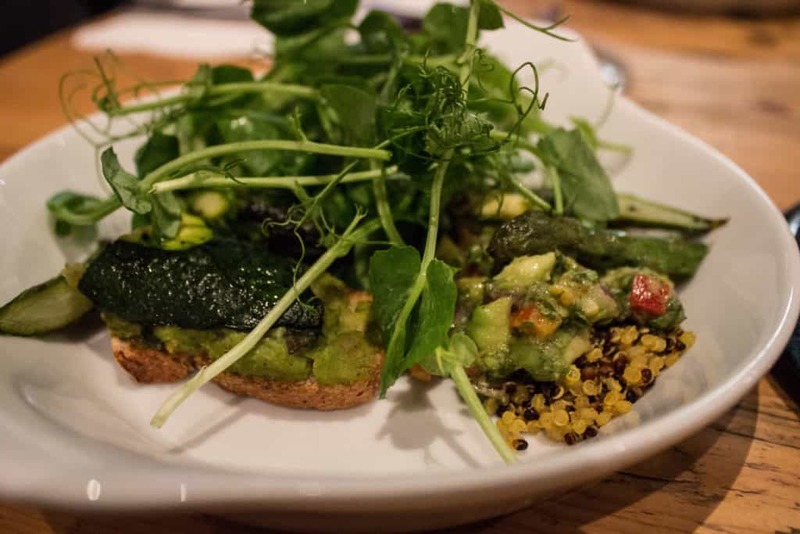 Now, on to my favorite part – the Vegan Dublin Food Tour! I highly, highly recommend doing this. As of now, they only happen on Wednesday nights but over time, I believe they will expand and offer additional tours/nights. I’ll be doing a full review very shortly where you can read about this tour in more depth to really get you salivating. For now, I’ll just let you know that this is the best food tour I’ve ever experienced. You are in a small group (8 people + 2 guides) and you walk short distances to six different spots sampling at least six different foods, two desserts, and four drinks. Everything is perfect about this tour. Go! I stayed in Dublin two nights – one night at the beginning and one night at the end of the trip. 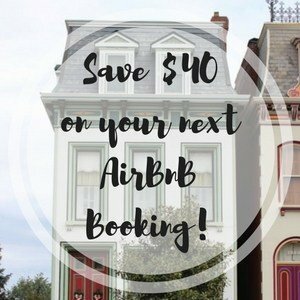 Both nights, I used Airbnb (use this link to get $40 off your first Airbnb). 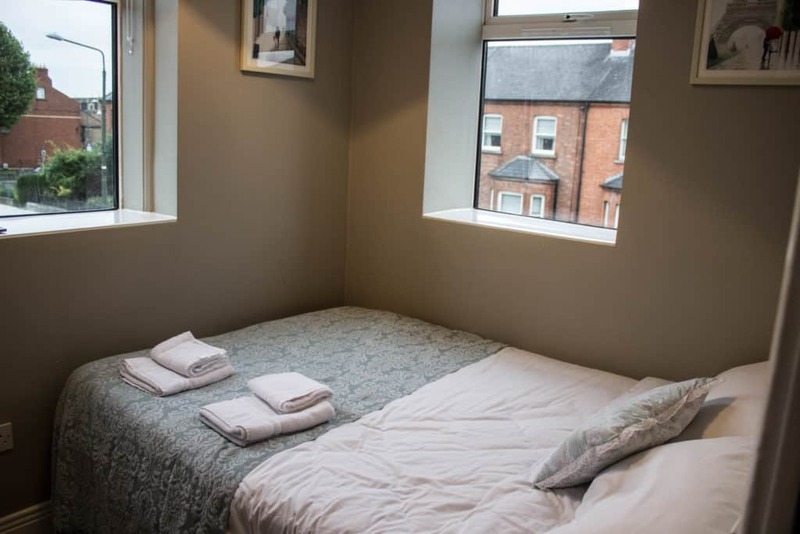 I found the prices to be more reasonable plus you have more privacy and access to a kitchen which is always nice when you’re on a budget or want to cook your own meals. The first night we stayed in an apartment on Botanic Road and the second night we stayed in an apartment on N Strand. Both were a little walk from city centre but not bad at all (maybe 20 minutes or so) – we actually walked everywhere we went so it’s completely doable! Check out my review here! 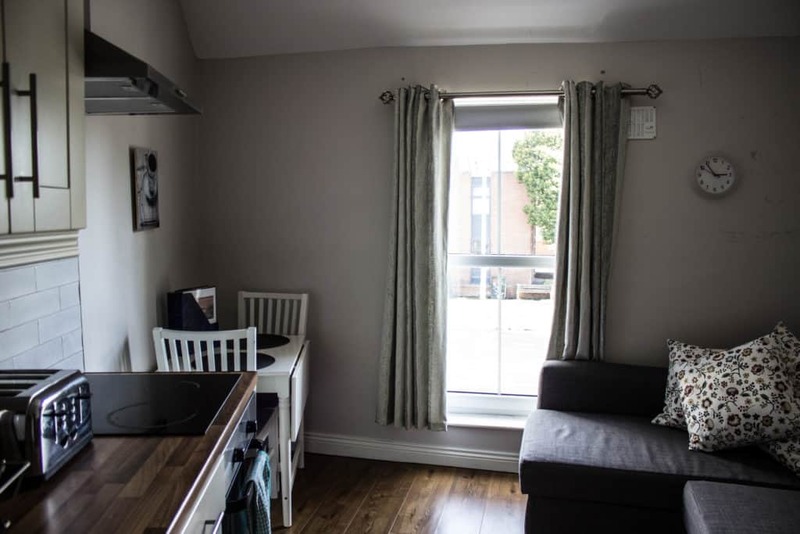 Looking for hotels in Dublin Read accommodation reviews here or book here. Want a guidebook? Here’s a Dublin one and an Ireland one. What else have I written? 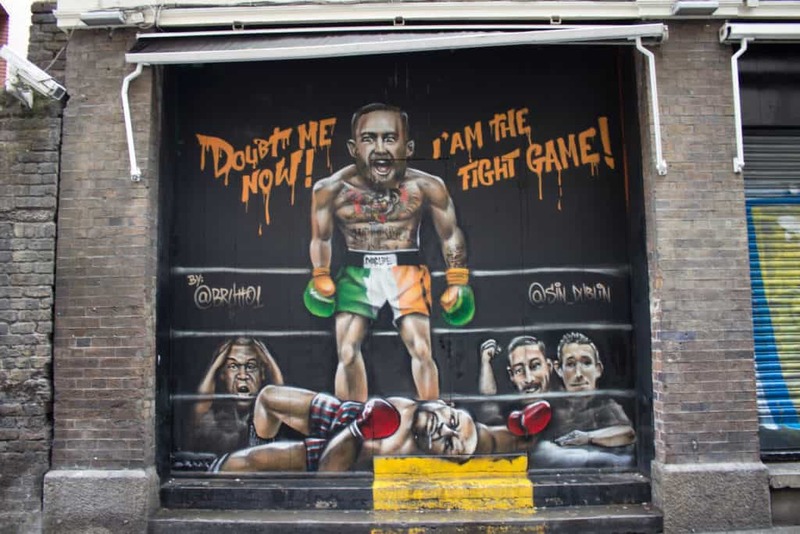 You can find more Dublin posts here and Ireland posts here. Some of the above activities were provided at a sponsored or discounted rate. As always, all opinions are my own and I will never promote something I don’t personally use and believe in, regardless of who foots the bill. Awesome info Ashley! What’s the exchage rate at this time? How often does that change? I love that you provided prices for most places too. I hope to get to go back to Dublin one day. I believe I had a few short hours when on ou cruise years again. Thats never near long enough. All look like fun things to do. That street art is awesome. I love wandering cities, stumbling upon inspired graffiti. So much fun. As for the smell of books I too have a fetish for that LOL. Something about walking into an old library and sitting down to that old books. Makes me want to read for hours. The smell of books gets me every time. Older books preferably but even newer ones smell great. One of the few things I spend money on! Great info, Ashley! Thanks for doing all the legwork and writing it all down! Smell of old books reminds me of grandma’s house…. Not necessarily in a good way. I am fascinated that you had such good vegan options in Dublin. I always think of boiled meat Irish cooking. The food you had dished out looks so much better than boiled meat and potatoes. I love all your street art pictures. It looks very different than when I was there four years ago. But that’s what is wonderful about a vibrant city: it stays fresh and changes as people leave their mark there. 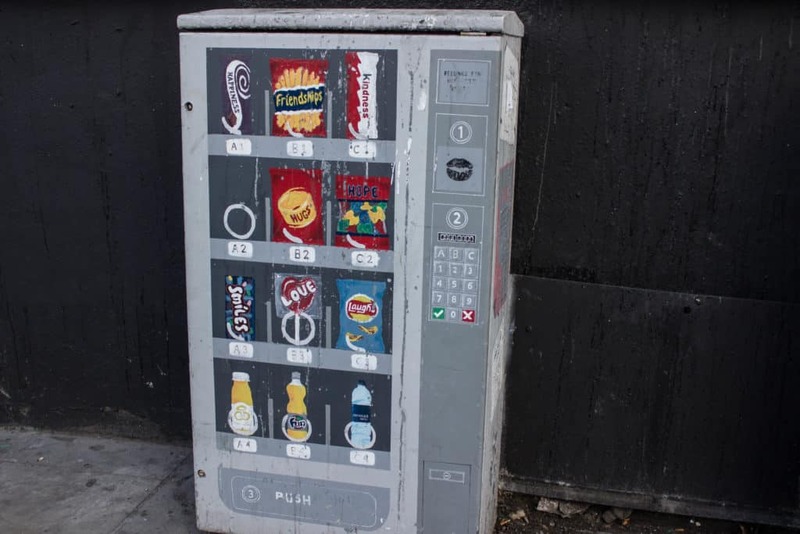 Thank you – I love finding street art! Dublin is so much fun! I’d definitely love to visit one day soon even just for the Guinness! 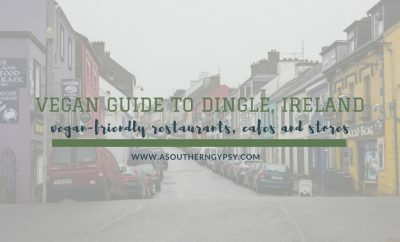 I am hoping to visit Ireland next fall and know I will likely be in and out of Dublin, so this guide is awesome! I hope you get to go Andi – it’s a wonderful place! What an informative post! 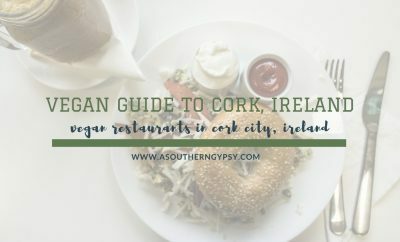 I still haven’t been to Dublin but this will help in trip planning when we do go 🙂 The food there looks delish! I hope you get to go one day soon! This is such a cool little guide to Dublin, and perfectly describes some of the highlights Mark saw when he went there. He didn’t have long either, but also managed to fit in a stroll through Phoenix Park, which is absolutely epic in size! 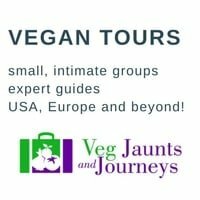 Thank you for the vegan element too – we have the same challenges when we travel so it’s really cool to see it included! Of course – I always love having a good vegan guide when I visit somewhere. It makes things much less stressful. I’ll have to check out Phoenix Park next time! Sounds like you have explored Dublin quite a bit and walked A LOT! I didn’t know you need a ticket to visit the trinity college library! Thanks for the tip for buying the ticket online to save some money! You’re welcome! I hope you can visit it one day – it’s wonderful! 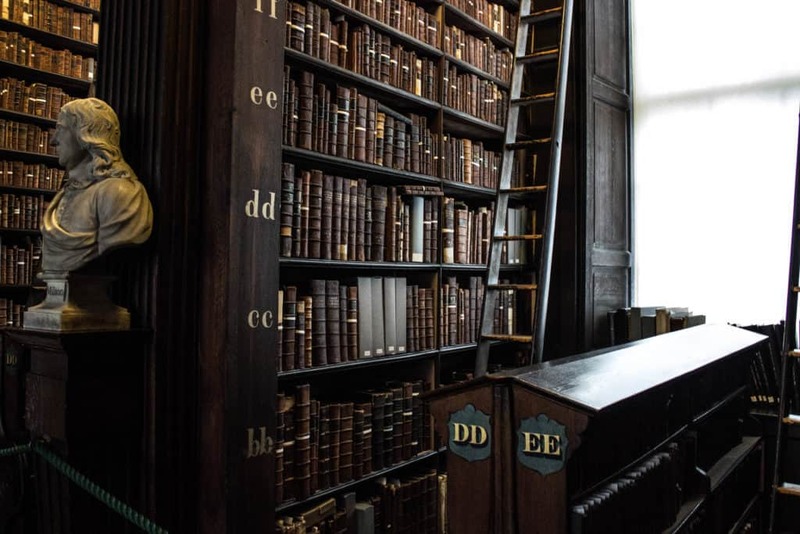 I loved the Long Room at the Old Library in Dublin, and I think your suggestion about booking a ticket to see the Book of Kells first thing in the day and making a beeline to get photographs of the Long Room is OUTSTANDING! I wish I’d read this before I went, because it would have been a huge help. Your street art photographs are great, and your food looks amazing. Your day in Dublin was well spent! I’d love to check out the library, and have a Guinness of course! Glad to see I’m not the only one that fits a lot into their sightseeing days haha, Ireland is on my list!